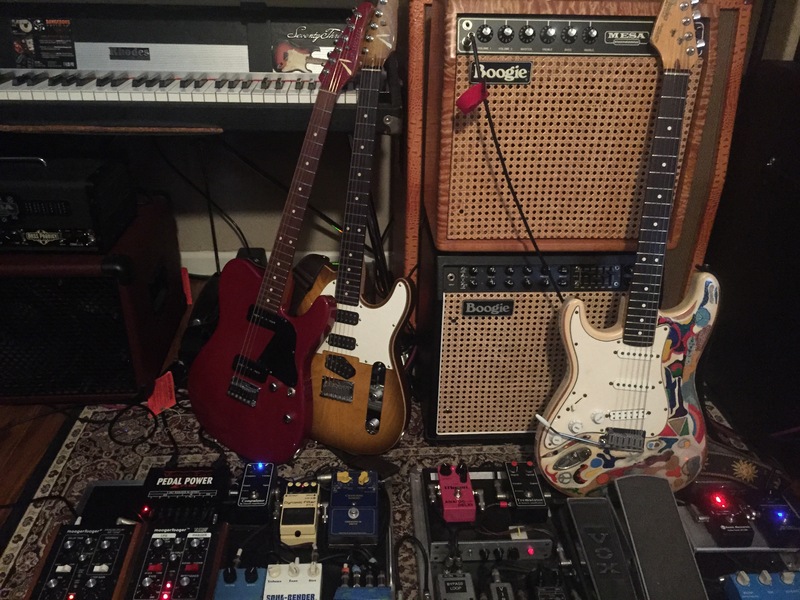 Two of MJ’s Tom Anderson guitars with James Zota Baker’s hand painted Strat and a stack of Mesa Boogie amps. Greg Lake loved his “Andys” and Boogies! In case you haven’t heard yet, one of our extended family of Anderson-playing brethren, Greg Lake, passed away yesterday at age 69 after a battle with cancer. I clearly recall Greg telling me how much he loved his blue Drop Top. You and I later talked about it, and you said, “I don’t know why he likes it so much. It’s an experiment that was never intended to be seen in public. 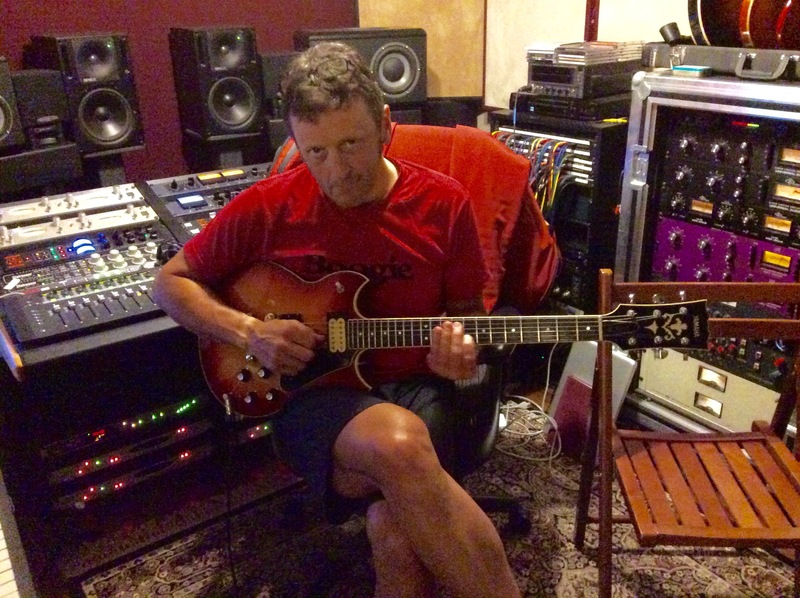 The top is nondescript, and the guitar is a B-flat at best.” Greg had an usual relationship with equipment. When he dug something, he was totally into it, but when he couldn’t figure it out, he simply gave up on it. He practically *gave* me his original Matchless DC30 after I was able to coax righteous tones out of it that he was not. Said it would be better in my hands than his. I have fond memories of him. RIP Greg. Everybody knew Greg Lake as the legendary singer/ bassist of Emerson Lake & Palmer, whose hit “Lucky Man” remains a Classic Rock radio staple 40 years later. Fewer knew he was the voice of King Crimson for a while. I knew him as the generous gear geek whose quest was the perfect note played with the perfect tone. When my mentor and chosen-brother Keith Wechsler brought me into the ELP fold as a “tone consultant” during rehearsals for a tour, Greg and I immediately bonded via our mutual affinity for Anderson guitars and Mesa amplifiers. Greg had recently obtained a new prized possession, a not-for-sale, in-house “tester” Anderson Drop Top guitar that he borrowed from Tom. To Tom’s surprise, Greg refused to return the guitar, despite reassurances that a non-tester finished product would be more satisfying and certainly better looking. Greg plugged in to his Mesa TriAxis preamp & Simul-Class 2:90 power amp and treated me to an inspired solo rendition of his 1972 hit “From The Beginning” from ELP’s Trilogy album. The guitar clearly was Greg’s Holy Grail instrument, obviously giving him tremendous joy to play. Afterward, he presented the axe to me with the reverence of a diplomat bestowing a rare artifact upon a head of state after signing a historic treaty. I caressed the fretboard with a few expensive-sounding Steely Dan chords before returning the crown jewel to its smitten owner. I then programmed some custom presets into Greg’s Mesa/Boogie rig, fine tuning them to his unique “touch” and style. He loved that rig, and was happy to have a few new colors on his tonal palette. Greg then asked me if I could help him with his new Matchless DC30 because he “couldn’t get a tone” from it. Matchless was, at the time, the new boutique kid in town. The flagship DC30 was intended to be a roadworthy Vox AC30-inspired amp with two separate channels and attitudes. I was already familiar with the amp because Rusty Anderson walked me through his DC30 before a recording session at A&M Studio A. I showed Greg some tips and settings, but he wasn’t feeling the amp. He was simply uninspired by the amp, and it showed. Greg handed me the guitar, and all of a sudden music began pouring by the bucket from the speakers. Horses for courses. I guess there’s no true one-size-fits-all. Greg’s generosity found its way to me. He believed that I would put the DC30 to better use than he, so he offered to give me the amp–which he knew was valued at $2500! I politely declined, saying that I would be willing to buy it from him rather than accept it as a gift. He asked if I had any cash in my wallet. I said, “Not enough.” He asked how much. I replied, “Only $600.” Greg said, “If you insist on paying for my gift to you, I insist you fork over that $600 right now.” With a wink and a big smile, he happily took my money. I took home a piece of Rock & Roll history. In the spirit of passing the gift of tone to those more worthy of carrying the torch, I ultimately placed the amp with six-string phenom David Weiss of Travis Whitelaw, Trailer Radio, Slackjaw and Steve Conte’s band. Dave is a solid friend whose fiery-yet-tasty playing never ceases to amaze me. Dave also appreciates his DC30’s provenance and its fabled “green transformer” mystique. Circling back to Greg Lake, another anecdote worth sharing is my recollection of a lovely “family day” in the park. FM radio giants Kansas and Tower Of Power were headlining an afternoon outdoor concert with Greg at Balboa Park in Los Angeles. Greg, a legend among rock’s royalty, was totally relaxed, low key, savoring the lovely weather and the company of his friends and colleagues. He was just another regular guy who was happy to share sandwiches, cheese and apples with the rest of us mere mortals, both before and after switching to the Rock Deity persona only while he was on stage. There was no isolated backstage cloistering on that day. Greg Lake, legendary rockstar, was unassumingly enjoying his picnic among a thousand diverse Angelenos from all walks of life. I don’t think anyone noticed him until he took the stage. If I recall, the closest Greg came to playing the rockstar card while off stage was when he and Wechsler, who played drums that day for Greg wearing a cast on his broken ankle (! ), introduced me to TOP’s drummer Dave Garibaldi, because I mentioned that it would be really cool to sit behind Garibaldi during his set. Mission accomplished. Cherished memory cast in stone. Sometimes it’s the little things that make the biggest impressions. Lucky man indeed. 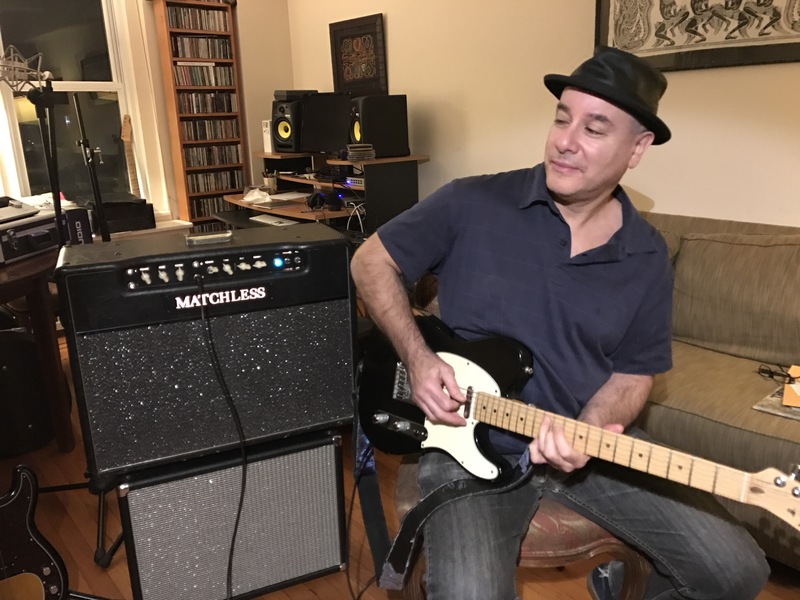 David Weiss playing his Matchless DC30 that I got from Greg Lake.